If you have ever visited the Trillium Lake area, in winter, you’re probably aware that it can get very busy and the trek can be very congested and uninspiring. However, if you take the time and exert the energy, you can really find yourself in a very complicated and exhausting trek. I have snow-shoed the Trillium Lake snow park several times, over the years and I have taken many side trips around the lake as well as taken some of the trails that take you well away from the lake. However, last week I attempted to get off the main trail and went straight up. I ended up at a bluff that I never knew existed and realized that I truly had stumbled on an amazing viewing spot This photo was taken from the top of the bluff. Unfortunately, you can’t see Mt. Hood in the background due to the overcast skies. I was amazed by the views, as well as how easy it was to get to the top. There are hundreds of massive granite boulders that make up the bluff and the hill beneath. 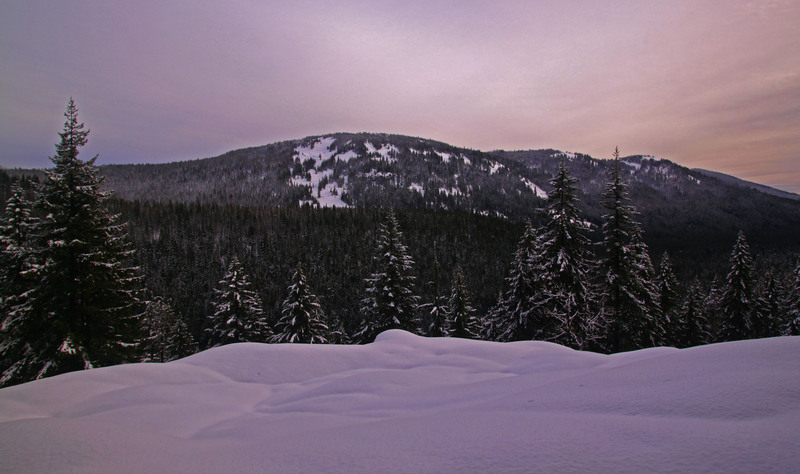 There is also pristine powder with huge boulders creating an awesome sledding opportunity. To understand just how cool this spot is, I recommend that you check on google maps and look for a small bluff of granite rocks standing in the middle of the forest. It’s just east of Trillium Lake. I was really lucky to find this spot since I had been asking myself if I was getting too bored with snow shoeing. This view changed my mind and made me realize that it’s worth making your own tracks. However, my story only gets more crazy from there. From this viewing spot, you can actually see highway 35 in the distance but unfortunately, you really can’t tell if it’s actually the 35 or the 26. This is where I made my first mistake. Because I ended up going around to the bottom of the bluff and skirted along the snow covered granite boulders, I really wasn’t paying attention to when I needed to change direction. The rest of the trek was pretty steep but I had fun traversing to the bottom and when I got there I noticed that there was a lot of water in the form of several creeks that were snaking between the elevations of the forest. This is where I crossed my largest and scariest snow bridge. It took me a while to find the best spot to cross but it was also over 8 feet above the creek and I ended up having to jump from one snow covered tree to another. Did I also remind you that I always snow shoe with my 5 year old Australian Cattle Dog? He always goes with me but he is also scared of having to swim or cross narrow bridges. Luckily the snow bridge was pretty wide so it was really easy to cross and my dog didn’t have any problems with navigating the bridge. Shortly after I got to the other side, I noticed that there were dozens of other creeks and brooks that I would have to navigate. I actually ended up in a huge meadow that was dotted with lots of shallow creeks. I still wasn’t sure how far I was from the Trillium snow park, so I decided to try to make my way towards the Hwy. However, just when I thought things couldn’t get any worse, I ended up breaking my snow shoe. The grommets and the plastic band that wraps around the aluminum frame completely broke off. This was my worst nightmare since I now found myself in a meadow filled with water and waist deep snow. I was especially concerned since I really didn’t know how long it would take me to find my way back and I wasn’t sure how many more creeks I would have to cross with a broken snow shoe. Once I realized that I couldn’t go any further I decided to inspect my snow shoe and realized that I could remove one of my shoe laces and wrap it around the snow shoe. Luckily it worked pretty good but I wasn’t really comfortable since I now didn’t have a shoe lace on my shoe. Nothing worse that having to snow shoe in waist deep snow and having to jump across creeks and brooks with a sloppy snow shoe. It also didn’t help that I was still pretty lost. Unfortunately, it didn’t get any better since I ended up having to pick a pretty scary part to cross the final creek of my journey. After I jumped several feet to the rocks and snow on the other side, I forgot to think about what my dog was going to do. Just as I thought, he too one look at his options and stood there and didn’t move a muscle. Without going in to detail, I spent the last 20 minutes pleading and cursing at him. I’m really glad that no one was there to see or hear me at this very low point of the day. At this point, it was starting to get a little dark and I had no intentions of spending the rest of my day trying to barter with my dog. I ended up taking off my snow shoes and crossing the creek in order to retrieve him. I finally picked him up and rather gingerly tossed him to the other side. I was exhausted at this point but I knew that I still had a rather long journey ahead. Luckily, I was in for a treat since I didn’t have to cross over any more creeks and once I noticed some rather broken up snow at the top of a small hill, I had finally reached the Hwy. I ended up paralleling the Hwy for about 2 miles until I reached the parking lot. I can now say that I had one of my most amazing snow shoe treks ever and it’s pretty crazy to think that I was questioning the joy of snow shoeing earlier in the day. How does one go about contacting you to inquire about possible permission to use one of your photos – with, of course, proper credit to the photographer? No problem with you using one of my photos. Have at it and thanks for asking for my permission.